After visiting Blackburn Museum and The Harris Museum, Preston to view their collection of Union Banners, I decided to look for any images of the banners in Lancashire marches. The first image I found was of a rare banner from Blackburn Museum. 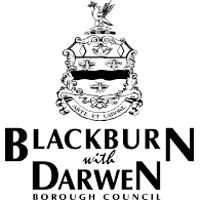 The banner is titled – “Blackburn Weavers, Winders and Warpers Association” and is included in “Banner Bright,” one of the definitive texts on trades union banners by John Gorman. It’s an excellent book that gathers some of the most spectacular banners from British trade union history into one collection. I find myself immediately flicking through the pages to find a mill banner from Blackburn. Its unbelievably exciting, particularly when the book tells me that the banner in Blackburn is a very early example of mill workers’ unions. Inspired to keep looking, I decide to make an appointment to view the images in ‘The Talbot Archive;’ an incredible photographic archive that is now managed as a research and community asset at the University Centre at Blackburn College. Peter Graham who manages much of the archival scanning and documenting introduces me to the collection and the images he’s found of the Preston Guild procession from 1952. Peter tells me that “Wally Talbot and his son Howard were Blackburn based photographers working in the areas of Press, Sport and Commercial Photography from the 1930s through to the 1990s. Wally Talbot was born in 1914 and at the age of 14 he started work as a “printer’s devil” at the Northern Daily Telegraph (now “The Lancashire Telegraph”). He was to become one of the paper’s first staff photographers. When the Second World War started he joined the R.A.F. as an Aircraftsman. He flew over enemy lines before and during bombing raids, identifying targets and taking photographs of the raids. He was also involved in taking public relations photographs which showed how the War was being won in order to send a positive message back home. He met celebrities such as George Formby who were entertaining the troops. Celebrities, military leaders and royalty alike were captured on film by Wally, and later, by Howard. After the War, Wally returned to the “Telegraph” for a few years before taking the decision to set up his own business. He worked from home using his son, Howard’s, bedroom, as a dark room and the bathroom for developing. When the photographs were ready they were sent by train to Manchester for use in the major papers. Within minutes, Peter has located images and the treasure trove comes to life. 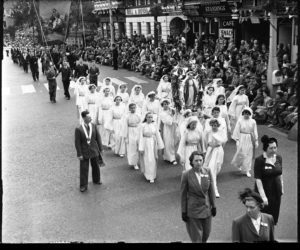 There are amazing images of the banners I have seen in the collection, being paraded in 1952. Suddenly there are people, faces and places that make the banners ‘human.’ I realise that the banner I am making is adding to a proud working class tradition that was once a familiar sight in both Blackburn and Preston. The photographic gifts keep coming however, and I receive a message from Andrew Wright of Lancaster, (who I know through the art gallery Bellwood and Wright) who has found two photographs of his grandmother, Annie Bann, who later became Annie Haworth and taught art at Bacton & then Fleetwood Grammar, painting a banner in the Harris itself. The photographs are from 1932. 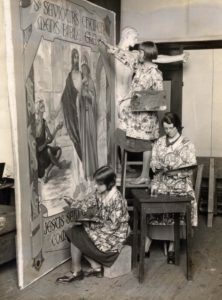 Annie was born in 1908 and is evidence of the banner making skills that existed locally . The photographs are beautiful and what strikes me is how contemporary the women appear. Annie herself has bobbed hair and cool shoes, she looks like a student who could be at art school now. It’s a perfect end to this phase of research. My next stop is Durham Banner Makers, where I will meet the crafts people and artists who keep the tradition alive. In less than a month I’ll be unveiling my first work at the Lancashire Encounters festival, a new banner adding to this rich tradition in Lancashire accompanied by an exciting performance in the Harris Museum that bridges Lancashire’s historical past to something much more recent.I had no idea, when this commission began, that weavers, wefters, warpers and acid house ravers would have so much in common. It’s these unexpected stories that makes this work so exciting.